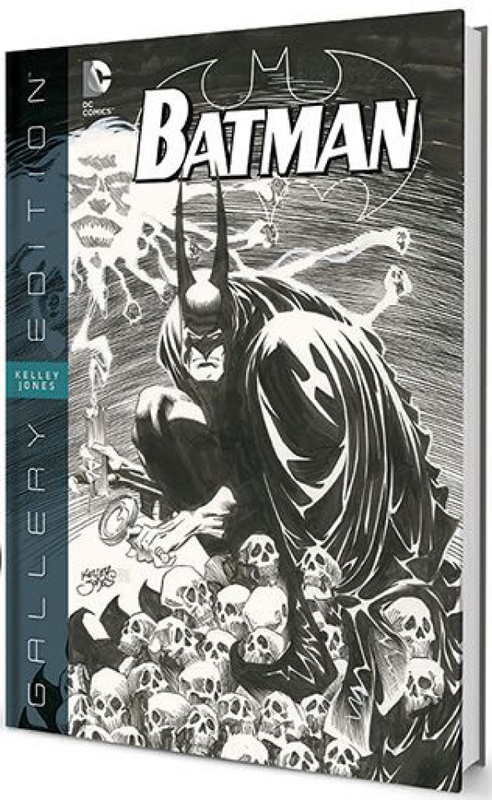 Graphitti Designs proudly launches their new, large-format hardcover book series with BATMAN: KELLEY JONES GALLERY EDITION. For the first time ever, Dark Knight fans and collectors will have the opportunity to see and own museum-quality reproductions of memorable Batman art...as it was originally conceived by the artist. Printed in color from high-resolution scans of the actual original art, this first entry in Graphitti Designs' new Gallery Editions line replicates the look, feel and attitude of the artwork. Every page is reproduced at original size on heavy paper stock, capturing the artwork stray pencil marks, whiteout, coffee stains and all! The pages are alive with all of the subtleties and nuances one would expect from BATMAN: KELLEY JONES GALLERY EDITION is the first in a series of deluxe, hardcover books from Graphitti Designs that faithfully reproduces the original art from select, key DC Comics series. This inaugural volume contains the covers and interior pages from BATMAN #515 through #525, minus the interior of issue #520, which Kelley did not draw. These stories are Written by Doug Moench, with most pages inked by John Beatty. Graphitti Designs' Gallery Editions reproduce the look, feel and attitude of the original art as it was Access to original art is an absolute must for the originally created by the artist. Though it appears to be printed in black and white, the contents of remains in the hands of the artists, most stories have these books are sourced from high-resolution, full- color scans taken directly from the artwork. Each high-quality, Smythe-sewn hardcover book captures every detail of the art at actual-size, and are printed at 200 line-screen on a rich, heavy paper stock. Replicating the original art experience is our goal. Our Gallery Editions are the next best thing to holding the original art in your hands and easier success of future Gallery Editions. Though some art been split up and scattered to fans and collectors across the world. Knowing that we have our work cut out for us, Graphitti Designs' approach is both pragmatic and practical while retaining our focus to produce the best, most definitive editions ever. We at Graphitti Designs pledge to always do our best to pack each Gallery Edition with the best source material available. With the help of the comics fan and collector community, we're confident you'll be very pleased with the books we produce.